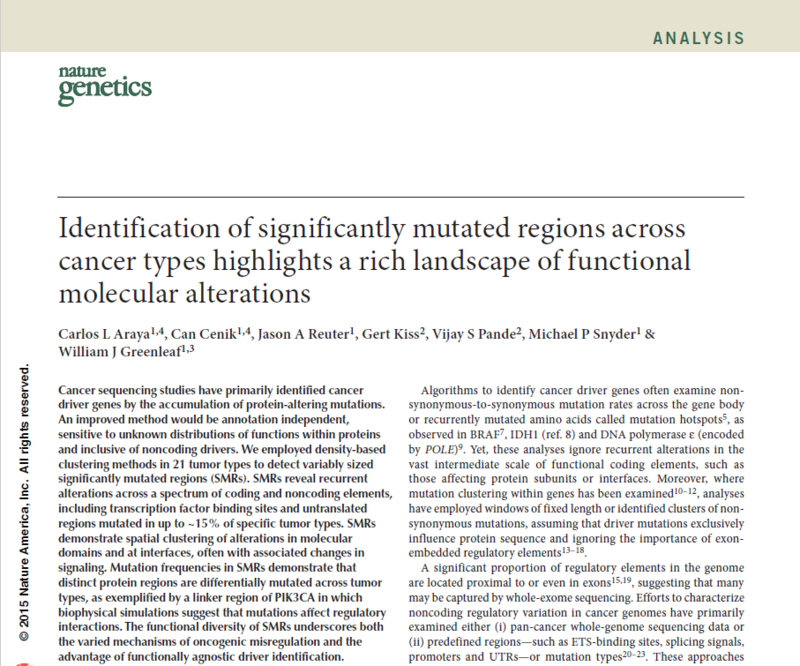 In cancer, driver mutations alter functional elements of diverse nature and size. 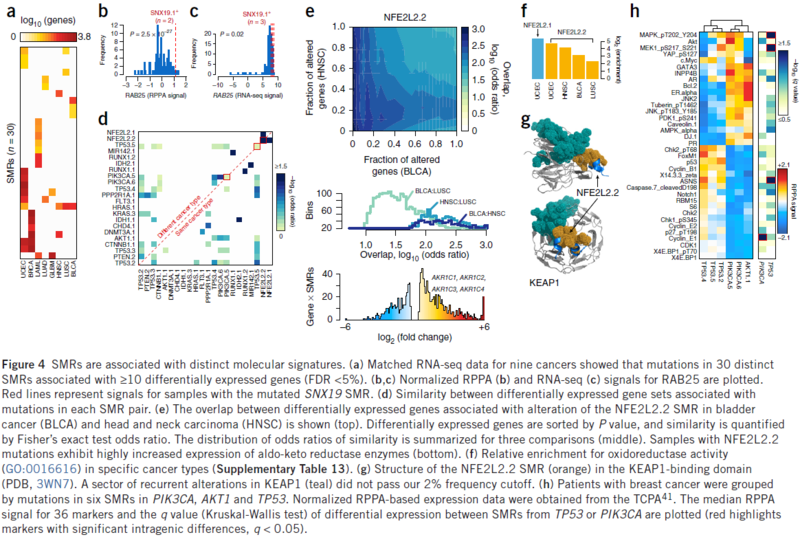 Systematic analyses of genomic regulatory activity in animals have identified substantial tissue and developmental stage specificity, suggesting that mutations in cancer type–specific regulatory features may be significant noncoding drivers of cancer. SMRs were associated with noncoding elements, protein structures, molecular interfaces, and transcriptional and signaling profiles, thereby providing insight into the molecular consequences of accumulating somatic mutations in these regions. 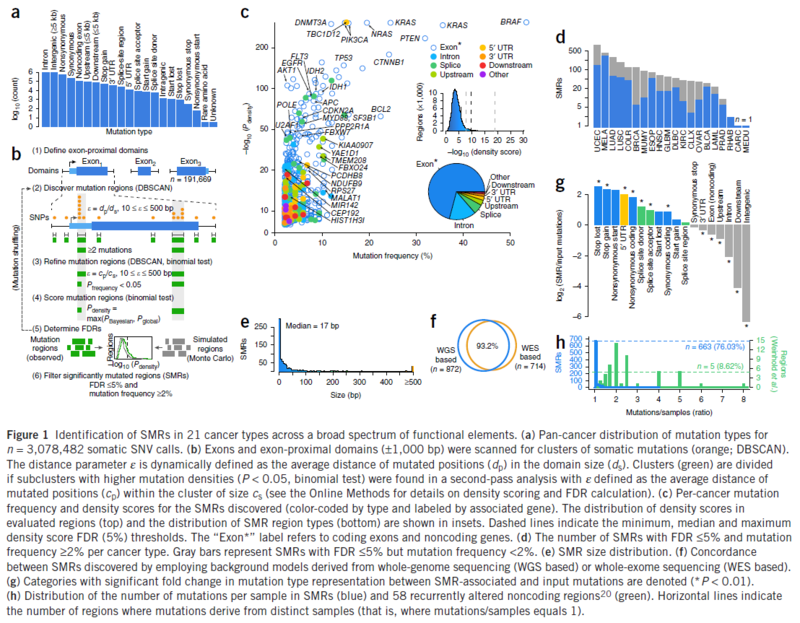 The identification of SMRs across multiple cancer types permitted a systematic analysis of differential mutation frequencies with subgenic and cancer type resolution. These findings underscore and extend recent associations between altered epigenetic regulation and histone alterations in tumorigenesis. We leveraged RNA sequencing (RNA-seq), RPPA and clinical data to ask whether (i) SMR alterations associate with distinct molecular signatures or survival outcomes, (ii) SMR alterations correlate with similar molecular profiles in distinct cancers, and (iii) SMR alterations in the same gene associate with similar or different molecular signatures. The identified SMRs also permitted interrogation of mutations in different regions of a given gene with respect to associated molecular signatures. This functional diversity underscores both the varied mechanisms of oncogenic misregulation and the advantage of functionally agnostic detection approaches. 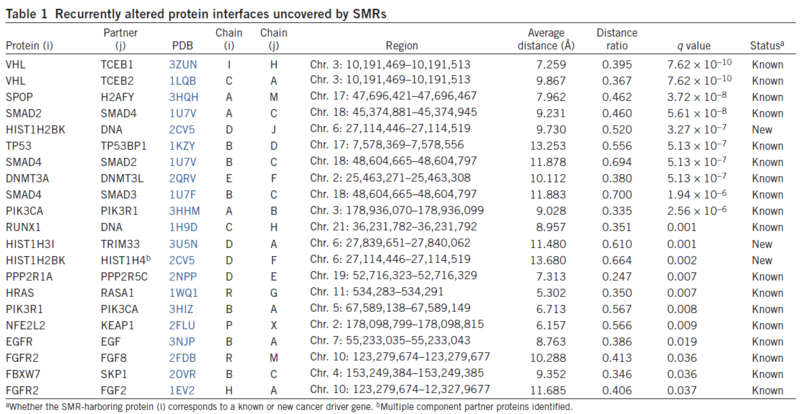 Notably, several of the most frequently altered SMRs lay within noncoding regions. Mutation models that account for cell type–specific expression and chromatin context at refined scales may require sequencing cohorts of matched normal tissue and increased sample sizes. Identify the spatial distribution of mutation recurrence in the genome, when combined with additional genomic, biophysical, structural or phenotypic information, often enhances mechanistic insights. 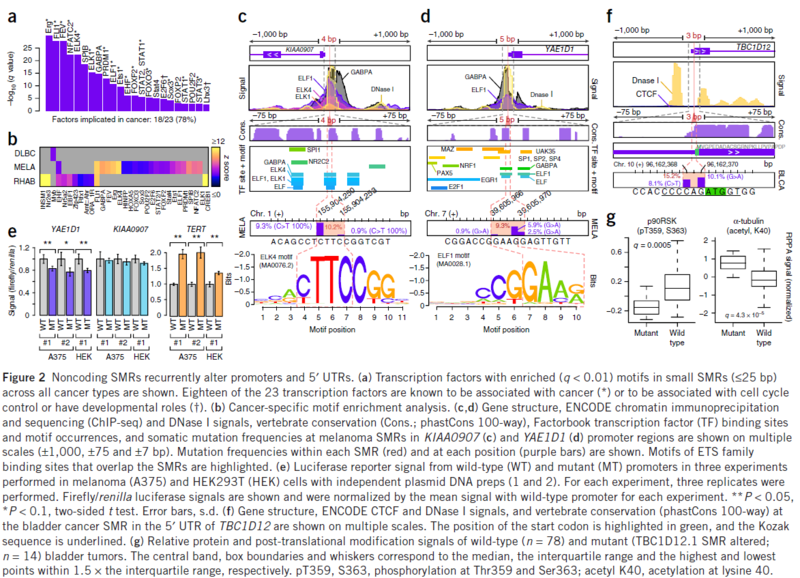 six SMRs in PIK3CA across eight cancer types (Fig. 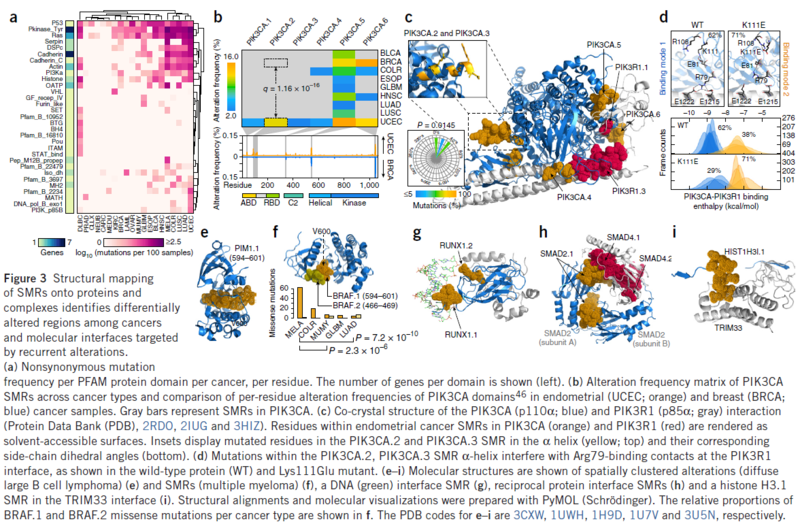 3b), with multiple cancer types displaying SMRs mapping to the helical (PIK3CA.5) and kinase (PIK3CA.6) domains. In contrast, we observed cancer type–specific SMRs (PIK3CA.2 and PIK3CA.3) affecting an α-helical region between the adaptor-binding domain (ABD) and the linker region between the ABD and Ras-binding domain (RBD) of PIK3CA. Matched RNA-seq data for nine cancers showed that mutations in 30 distinct SMRs associated with ≥10 differentially expressed genes. SMR-specific differences in ASNS levels and MAPK and MEK1 phosphorylation among samples with altered TP53 SMRs.